Summer might be coming to an end–which we’re only OK with because we’re anticipating the beauty of an East Coast fall. Let’s finish out the summer well, with good times spent in the unfrozen outdoors. At the beginning of the summer, we posted a few of our favorite outdoor events, and luckily, there are still a lot of fun things to do in Falls Church, VA to finish out the summer just right. Here are our top five. Yes, you could stay inside and watch a movie from the comfort of your luxury apartment in Falls Church. But there’s just something about lying on a blanket under the stars and enjoying a film that makes you feel happy to be alive. That, and Falls Church outdoor movie nights won’t last forever! 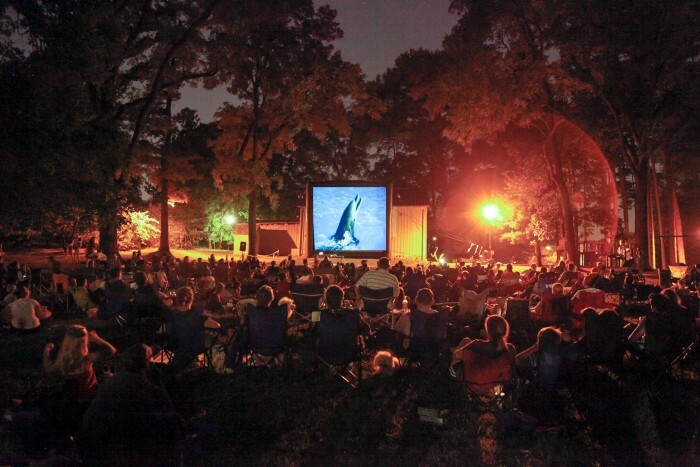 Head to Sunset Cinema in Cherry Hill Park (312 Park Ave, Falls Church, VA 22046)* for one of the following movie nights. Don’t forget bug spray and snacks (or buy popcorn, candy, and drinks there). *In the case of inclement weather, screenings will be moved into the Community Center as available. Don’t think a farmhouse sounds like fun? The Cherry Hill Farmhouse, a historic landmark in VA, will change your mind. This 19th century historical spot is a great place to explore with friends, and they host special events onsite. If you’re a tea drinker, reserve a private tea for 12 or more people, and enjoy an educational talk by a docent in full-on 19th century garb. This isn’t just herbed hot water, either–you’ll enjoy finger sandwiches, sweets, and fruit. Tea not your style? If you’re interested in the history of the farmhouse, you can wander the grounds and go on a tour. Check their site for details. The Eden Center, aka the “Unofficial Vietnamese capital of Virginia” according to one Yelp review, was voted Reader’s Choice in Washington City Paper for “Best Shopping Center” for good reason. This Asian center is a massive hub (120 stores) brimming with the best Vietnamese-American bakeries, delis, jewelers, and restaurants in Virginia. You could spend an entire day wandering from shop to shop, testing bubble teas, Banh Mis (Banh Ta Deli gets major props on Yelp), and delicious Pho. Pro Tip: get there early, as traffic can be overwhelming later on. Yes, the state-of-the-art gym at West Broad Residences is amazing–but now is the time to enjoy early morning or sunset runs (during the day it’s just way too hot). Take advantage of the beautiful tree-lined streets and go for a jog, or head out to Scott’s Run Nature Preserve to soak up some nature. Or hop onto your bike and head out for a ride near Falls Church. You’ll boost your endorphins while fully appreciating the final days of summer! And finally, the very best way to finish out the summer? Sign your lease for a brand new luxury apartment in the charming little city of Falls Church: a place where summer might end, but good times certainly do not. Stay updated on the latest by following us on Facebook, or get in touch with us today.